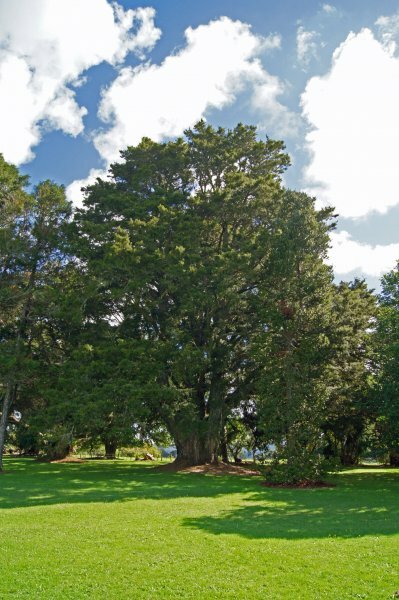 Probably the largest planted ornamental tōtara in New Zealand, although that assessment is somewhat affected by the branching at or near ground level. 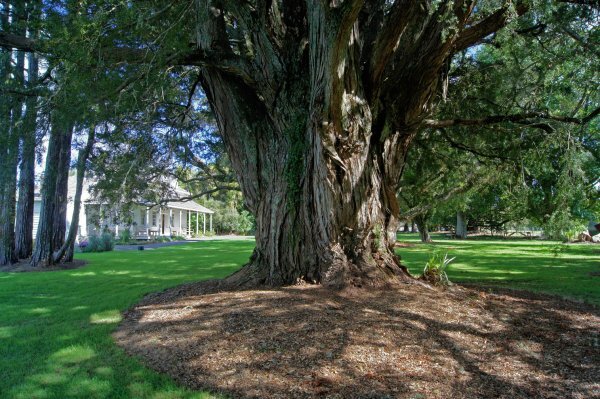 Burstall noted that it was not known if this tree was planted by the missionaries of Te Waimate, but an early watercolour of the mission house show no plantings on the grounds in front of the house in 1845. Another painting from around the same time  shows saplings on the grounds in front of the house. 2. C. Bridge, View of the Waimati (missionary station) and Poka Mie Hill in the distance, 1845. Alexander Turnbull Library. Taken at 0.7 m above ground, at smallest apparent diameter above buttressing and below branching. Typical open grown tōtara, branching at or close to ground level. 23 Apr 2016 Smillie, M.J.
To the northeast of the mission house.